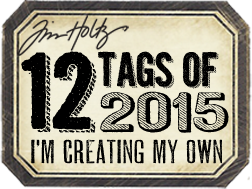 Above are my April 2015 Tim Holtz tags. I fell in love with his "NEW" dies....I gotta have them.. I like some shimmer and bling every now and them. it shimmer. My photos didn't do a good job picking that up. But I know it's there..."GIRLY" stuff! inspiring teacher....I never get tired of learning from him.